His second-placed Reds side were held to a goalless draw by the team one place behind them on a blustery Oakwell night, as conditions were bemoaned by both managers. Coach Stendel said: "I felt we were a little bit better than Sunderland but, in the end, no team has scored. We keep the gap but we wanted to win this game. “In the first-half we had two chances to go in front. It was difficult in the conditions. It was different in the second-half and Sunderland played a lot of long balls with the wind and had two chances to score. It was Barnsley’s fifth clean-sheet on the spin as they kept out a Sunderland side that have scored in every game so far this season and are still four points behind the Reds with one game in hand. “It’s not only today, in the whole of the season we are defending well,” continued Stendel. “We have a lot of clean-sheets and that’s because of all the players in the team. If we had scored we would have won this game. Sunderland is also a good team. Both teams have a chance of promotion but a draw helps us more than Sunderland. 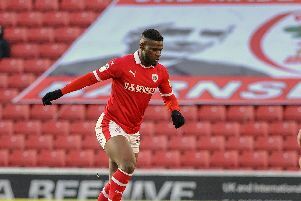 Despite missing several chances through Mamadou Thiam, Dimitri Cavare and Cauley Woodrow, it’s still 17 without defeat for Barnsley - who also haven’t lost on home soil since March 17th, 2018. And next up is another important match for Stendel, as his team make the short trip to Doncaster Rovers’ Keepmoat Stadium for a South Yorkshire derby on Friday night.